A common business requirement is getting an average of a data set of the past few days to include in a report. 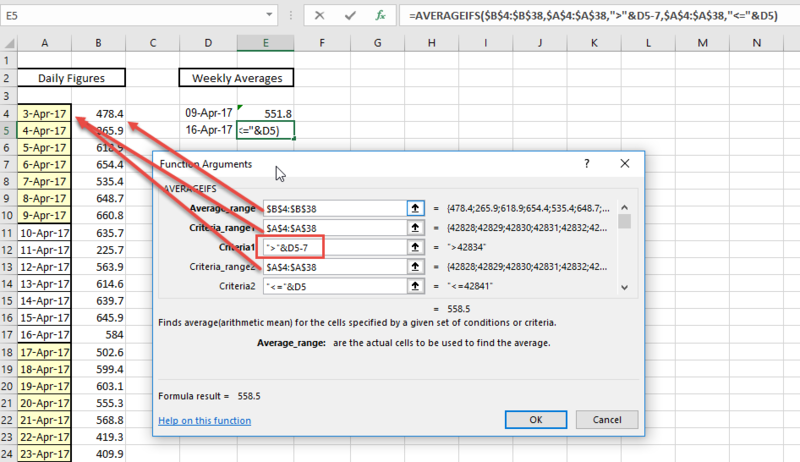 Perhaps you want to create a weekly average based on daily data. So how can we get the average from the previous week when the data is shown daily. As shown below we want to see the average for the week ending 9 April (so 3rd to 9th April) and the average for the week ending the 16th April (10th to 16th April). 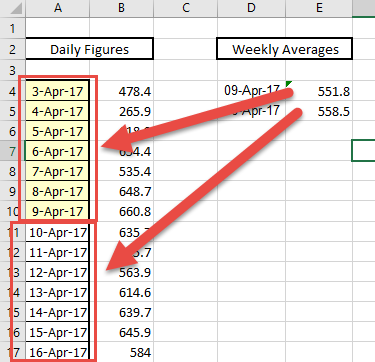 We want to create it in such a way that we can copy it down, so just by looking at the date in column D, it must know what to average. The correct formula to use would be the AVERAGEIFS formula (note the plural- don’t get confused with AVERAGEIF). The end result will be that it will find the average for the 7 days previous to the date in cell D5. This can be copied down now.